We thought the best way to explain this program was to let Brian, our lead lawn care manager, respond to some of the questions we’ve received from customers. Take it away, Brian. Brian: I get asked this question a lot. It’s such a new concept in lawn care, not many people know about it. We are very excited about the Organic-Hybrid program. It’s designed to replace manufactured nitrogen with organic-bio nutrients. Up to 75% of the chemicals used in this program are replaced by organic, natural nutrients. Hybrid comes from retaining the pre-emergent targeting crabgrass, traditional weed controls to combat broadleaf weeds and insecticide as part of the program. Q: Is this program more expensive than traditional fertilizer programs? Brian: The Organic-Hybrid program costs the same as traditional programs. Brian: An awesome, healthy, green lawn that is safer for the environment and the ones you love. Granted, full 100% organic programs have had their issues, lack of green color or curb appeal. Organic-Hybrid is a great way to achieve a great looking lawn AND eco-friendly. At 75% organic, it’s a big hit with the environment. Q: Why would I want to do this Organic-Hybrid program? Brian: If you have kids or pets, this is a great way to reduce the amount of chemicals in your lawn. For the environment, it’s hands down more eco-friendly due to the bio-nutrients used. Organic-Hybrid is the best way to give you the green lawn you want with a less harmful impact on the environment. We feel so strong about this program, we guarantee it. 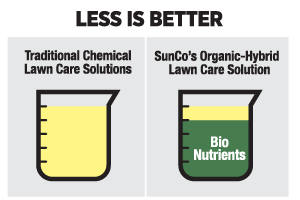 Let SunCo create a beautiful, green, healthy lawn with strong roots and thick turf using less fertilizer and pesticides.